Mary Debono is a successful Feldenkrais practitioner who works with both humans and animals. She creatively applies the principles of the Feldenkrais Method to her work with dogs creating simple and powerful process that can improve your dogs health and behavior. 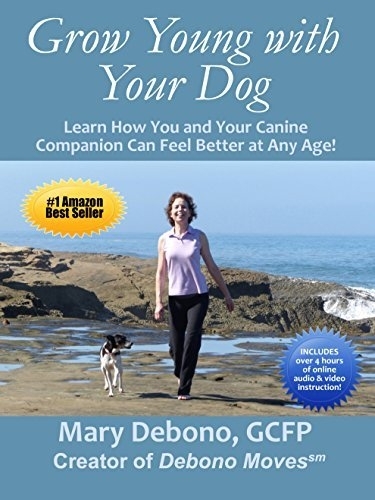 Mary carefully leads the reader through gentle exercises (she calls Debonomoves) to improve their dog's functioning and to enrich the connection between the humans and their canine companions. 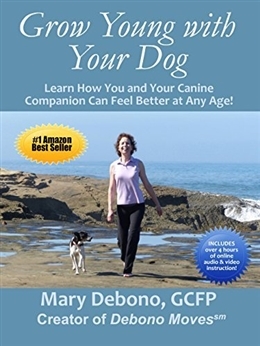 Eventually she invites the humans into the process of stress reduction and improved health, leading to the feeling of "growing younger" mentioned in the title. Each chapter has engagingly written stories about Mary's impressive work with specific challenged animals. This is a fun and assessable hands-on book. Chapter One: A Canine Mission Impossible? Chapter Five: What Do Torn Knee Ligaments, Arthritis, and Habits Have in Common? Since many people are more open to connecting with their pets than to themselves, this book can serve as a backdoor introduction to the Feldenkrais Method as many of the principles of the Method are clearly and simply described in the context of working with one's pet.